11-Apr-2006 -- This is the first visit to a Confluence on a two-week trip through the United Arab Emirates and Oman. All land based degree confluences in the Emirates have been already visited and well documented, so the challenge was to capture one of the two last remaining Confluences in the ocean with view of land. Alasdair MacKenzie had attempted this Confluence two years earlier. Unfortunately, he could not find a ship, but he left some useful information behind, saying that the Hilton Hotel in Ra's al-Khayma is able to organise deep sea fishing in the area. After visiting the Emirates of Dubayy, al-Šāriqa (Sharjah), Ajmān we went to the northernmost Emirate Ra's al-Khayma partially hiking and partially taking taxies. On 'Confluence Day', the first we did in the early morning was to go to the Hilton Hotel and ask for trips for 'Deep Sea Fishing'. But all they had to offer were boat trips that start from Khaṣab at Musandam Peninsula in Oman, which do not come close to the confluence point. Now we had to make a new plan. The first attempter of this Confluence Alasdair MacKenzie didn't find a fishing boat in al-Ša`m, which is the nearest village to the Confluence (8.5 km beeline from the DCP). But why not try again, we thought – it's another day and we would approach other fishermen and ask them to bring us there. In order to get to al-Ša`m, we had to make a 30 km trip to the northernmost point of the UAE. This area is not densely populated and as a consequence, public transportation is not available. The car rental companies were not able to have a car available spontaneously, so we had to take a taxi to al-Ša`m. At 10:30 a.m. our taxi driver from Bangladesh brought us within 20 minutes from the city Ra's al-Khayma to the peaceful fishing village al-Ša`m, thereby passing through mountainous desert land, cement factories and the giant industrial port of Mīnā' Ṣaqr. At al-Ša`m time seems to be standing still. In the heat of midday the fishermen were lying in the shade or preparing their lunches. We asked them if they could take us to a little boat cruise, but in their replies we clearly understood the word 'permission' and their hands were pointed to the nearby police station. 11:00 a.m. we approached the coast police station and asked for permission to make a little boat trip with some local fishermen. But the head of the police station seemed not to have the authority to let us go. Instead he sent us to the coast guard headquarters in al-Rams which is a city 20 km further south along the coast. At this point, a successful confluence visit seemed out of reach, but we didn't want to give up yet. There was no taxi in the village al-Ša`m – but the owner of the supermarket gave us a free ride to al-Rams, dropping us off at the police station. The policemen however redirected us to the coast guards office at the harbour. We took another taxi to their office and again the same procedure followed: handshake, some explanation from our side and a negative response from the men in uniform. This time we were sent back to the harbour police in the capital Ra's al-Khayma where we initially had started. At this time there wasn't any hope of success and our mood hit the bottom rock. Additionally, while taking a taxi back to Ra's al-Khayma an internal dispute between the members of the confluence hunting team (i.e. me and Elionora) had broken out. While I was 100% concerned with a successful DCP visit, Elionora missed the sightseeing aspects of it. She justifiably complained that we had been to the pretty fishing village al-Ša`m without actually visiting, hiking around and enjoying the beautiful peaceful place. But now going back was quite a trip, so we continued our taxi ride to the Ra's al-Khayma Customs House. Although we rated our chances for success to almost zero, we continued our efforts and went inside the fancy office of the Government of Ra's al-Khayma, Customs & Port Department. We were directed in a nice waiting lounge and after 15 minutes, we were let in the office of the General Director, Muḥammad A. al-Mehrizi. Sitting in front of his huge desk we were offered original Arabian qahwa and started chatting about the Emirates, Germany, etc. Then we were asked to bring forward our request. After listening to our proposal, Mr. al-Mehrizi asked a consultant whether our wish was realistic and could be fulfilled. After the consultant mentioned that this was no problem, we were given a boat with driver to make a special trip to the Confluence. At 13:20 we started from the harbour with our little speed boat and our Indonesian steersman Imade Widana and the Indian boatman Chikati Ravikumar. The beeline distance from the harbour to the DCP was 24 km, which we covered by high speeds of 36 km/h within 40 minutes. The sea was calm and the ride very pleasant. After we had approached the degree intersection, Imade managed to steer the ship precisely to the desired point with an amazing residual distance of only 3 m remaining. Interestingly, the DCP is located in a 'parking lot' for container ships and oil tankers. The nearest of the five huge vessels was just 500 m from the point. Although located in the ocean more than 5 km from land, the location was quite busy with birds flying around in formations and smaller boats passing by. The giant port of Mīnā' Ṣaqr and the mountain Jabal Bil `Ays with a height of 1934 m were clearly visible in south-eastern direction. At 15:00 we were back to the harbour in Ra's al-Khayma city. Time at DCP: 14:00 p.m. 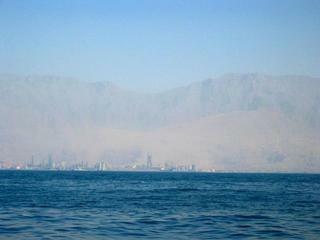 Description: In the northernmost tip of the UAE, in the Strait of Hormuz, ca. 5 km from the coast, also not far from the Ṣāliḥ Oilfield which is currently exploited. Story continues with three confluence visits in Oman at 23N 59E. In the Gulf, a few kilometers from shore. Closest piece of land is the tip of the Ṣaqr Port mole, about 5 km to the SE.